Seen a swing like this? I think it is practically perfect! Here is her cute USA pic. While I am in the bragging mood... my other sisters, the twins, Adie and Haley were SO STELLAR as well. They played PROFESSIONAL softball for the Chicago Bandits! I am so proud of them and happy that I got to go to a few of the games in between having my girls. 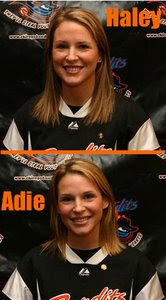 Here are their pics off the Chicago Bandits website.... too bad they switched their names! No one can tell them apart.... I can. I have ALWAYS been able to tell them apart. Ever since I was little I was always the expert on my sisters. I would correct everyone! So I think I am done bragging about my sisters.... we are a very sporty family. My dad had four daughters (Another Haus of Girls) and being a professional baseball player in his past he helped guide us into the athletic side of life. (Definitely no cheerleading allowed!) I am so thankful for that. Sports, in my opinion, influences girls in so many ways. From self-esteem, learning to never give up and realizing what it takes to be part of a TEAM. I hope my three girls play sports and succeed in all they do just like me and my sisters did. After we watched Aunt Maggie hit a homer today on tv Mia started running around going crazy! She started pretend swinging a bat and said to me, "Mommy, I am going to be on tv one day just like Maggie and hit the ball over the fence SUPER far!" I hope I get to see her hit a homerun someday! Yes Marta Maggie has a great swing! 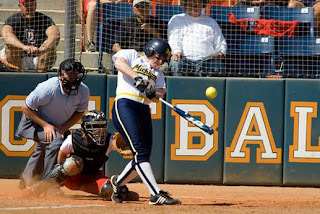 I didn't see her play until the 2009 WCWS and could tell right away that she has one of the best swings in the country. Maggie seems to share her good looks with her sisters but which sister does Maggie get her beautiful yet vicious swing from? P.S. - I'm not sure what profile to select as I'm not used to Twitter so I chose anonymous.